Okay, I don't know how so many of you other bloggers do it! Not sure how clear this has ever been, but I normally do my week's outfit photos on the weekend before. Since there's only two outfits a week, I've always felt that my moods and thoughts on sartorial choices were still very authentic if not the very day of (though, honestly, many outfits were ones worn later that week too!). Its what works for the time we have. However, thanks to daylight savings and a busy weekend, we were out taking shots Wednesday evening for this post. And all I have to say it- Praise be to all you bloggers who usually only take photos the day before. Last minute is not my forte. There's not too much more to say about the outfit itself. It is what I wore that day, so it's another work outfit. My pencil skirt is a workhorse of the closet, especially for the job, as is this chambray shirt. My morning routine has definitely proven the advantages of having a closet where most everything works with everything else. Who wants to spend that time deciding what to wear when you could be drinking tea and enjoying puppy cuddles before work? Okay, okay. I love clothes so there are still questions about what to wear, but-! The point still stands, amirte? P.S. This is the same location as almost exactly a year before! Ironic, no? Well this is simply a brilliant look. Obviously your closet strategy is working well for you. I need to add a red pencil skirt to my consignment shopping list. I just love this one on you. The way you are able to get your belts is perfect. Mine never turn out that good. I am a person that needs some time to choose what I'm going to wear. That is why I find my blogging so helpful. I sometimes with quickly go to the blog and scan for an outfit that I like. I like the neat look of this outfit. And I have no idea how some bloggers manage to take pictures every day haha. I just don't have the energy for that. Perfect pop of color with the skirt <3 I love how you tied the belt! I'd choose puppy cuddles every time too, haha! 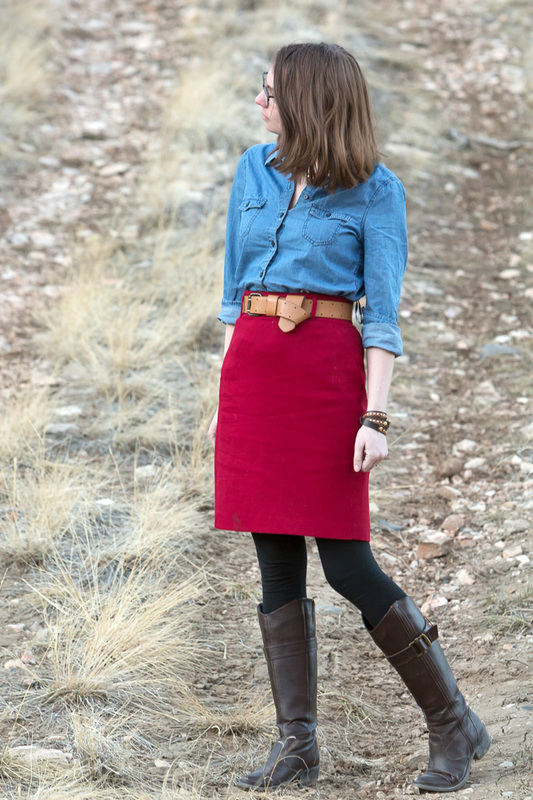 And this outfit is super pretty- I love how chambray looks with berry colors. 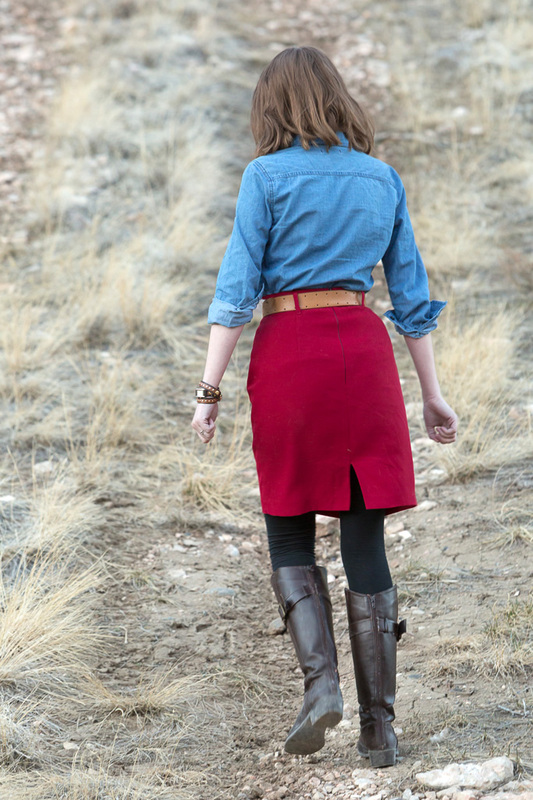 I love how you style this skirt! My picture taking is totally unorganized, haha :) During the winter I got better about taking outfit photos in advance but when the days stay light longer I become more last minute. I'm not sure how bloggers who post outfit photos everyday do it either. I don't do a lot of wiw posts but when I do, they're always from a day or two before. 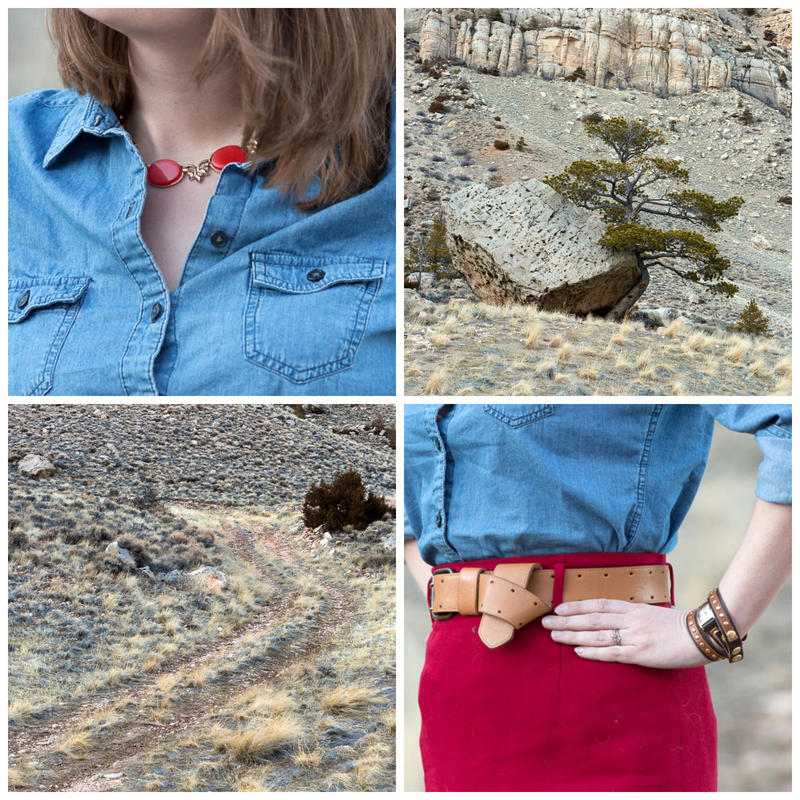 I love how you've teamed the pencil skirt with the chambray shirt. I would have gone classic and just constantly worn it with black! I'm also one of those twice a week or so types of bloggers. I honestly don't know how so many bloggers find the time (and perfect conditions) to take photos, edit them, write a post, etc. Like, kudos, but I just can't!!! I also take my photos in advance. Sometimes it's a week or so in advance, other times it's the weekend before. No rhyme or reason, really. This is a perfect outfit for spring! 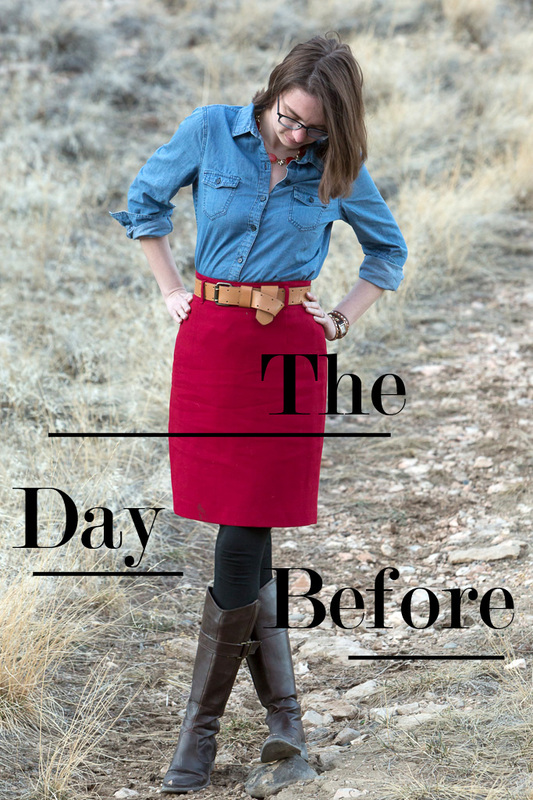 I love skirts with chambray!